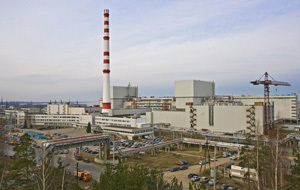 Leningrad Nuclear Plant's Unit 2 was expected to be restarted this week following repairs to a malfunctioning turbine. The reactor was taken offline on Dec. 18 after plant staff reported a steam leak from the turbine. Plant Director Vladimir Pereguda said the steam leak did not necessitate any evacuation protocols for plant staff, or from Sosnovy Bor, the closest town to the facility. Pereguda also said the leak did not have any radiological impacts above natural background radiation. On the International Nuclear and Radiological Event Scale (INES), this incident is considered to be at level zero, which indicates no safety concerns were present. The Russian news agency TASS said the three other reactor units at the plant remained in operation during this outage and were not impacted by repair work at the second unit. TASS also said these other three reactor units have a generation capacity of approximately 3,000 megawatts of electricity. Prior to coming back online, staff at the plant will carry out testing and inspections on Unit 2. Want to get notified whenever we write about Leningrad Nuclear Power Plant 2 ? Next time we write about Leningrad Nuclear Power Plant 2, we'll email you a link to the story. You may edit your settings or unsubscribe at any time.